Columbia-TriStar, widescreen 2.35:1/16x9, languages: English DD 5.1 [CC], French DD 5.1, subtitles: Spanish, Korean, single side-single layer, 61 chapters, rated R, 127 min., $29.95, street date 4/29/97. Academy Awards: Nominated for Best Supporting Actor-John Malkovich, Best Screenplay Written Directly for the Screen-Jeff Maguire, Best Film Editing-Anne V. Coates, 1994. Directed Wolfgang Petersen. Starring Clint Eastwood, John Malkovich, Rene Russo, Dylan McDermott, Fred Dalton Thomas, John Mahoney. In a performance that won universal acclaim, Clint Eastwood stars as Frank Horrigan, a veteran Secret Service agent haunted by his failure to protect JFK from assassination. Thirty years later, he gets a chance to redeem himself when a brilliant psychopath threatens to kill the current president, and take Horrigan with him. Taunting him by phone and tantalizing him with clues, the assassin (John Malkovich) lures Horrigan into an electrifying battle of wits and will that only one man can survive. Co-starring Rene Russo as Horrigan's risk-taking fellow agent, In the Line of Fire is a high-wire balancing act of searing suspense, explosive action and surprising romance. I just can't figure out what I really think of Wolfgang Petersen. On one hand, there's his legacy from Das Boot, which isn't a positive one for me. So many people are convinced of the brilliance of this film that I've tried about five different times over the years to sit through it, but I just can't get past the first hour or so; man, that movie just bores me to death! But then again, Petersen's produced a nice string of solid action movies during the 1990s. Air Force One, Outbreak, and In the Line of Fire; these are all well-produced, professional pieces of work. And somehow, Petersen's movies leave me strangely cold. 1993's In the Line of Fire exemplifies Petersen's strengths and weaknesses well. It's an exciting, fairly compelling movie, although it's my least favorite of the three films mentioned above. Seemingly, all the pieces are in place for this movie to have been a really terrific experience. You have a great veteran half, headlined by Clint Eastwood, fine production values, and a very provocative plot. So why do I end up thinking that the movie is only pretty good at best? I think the responsibility lies with Petersen. While he stages action sequences effectively, there seems to be a lack of passion, a kind of mechanical aspect to his direction that keeps these scenes from taking on any kind of real life of their own. Don't get me wrong - the action bits work well and they deliver some excitement. I just always feel vaguely unsatisfied after a Petersen movie, in a total being less than the sum of its parts way. I also like the fact that In the Line of Fire provides a nice portrayal of how difficult a job being a Secret Service agent must be. You have to protect the world's most powerful and famous person, someone whose job - especially during a campaign - requires him to be in very public places. I can't imagine what a nightmare all the logistics of that task must be, but the film neatly gives us some idea. In the Line of Fire was the first film to use one aspect of Petersen's MO for the 1990s: a prominent cast headed by a tremendously famous and respected actor. Harrison Ford in Air Force One, Dustin Hoffman in Outbreak, and Eastwood here; that's many years of box office star power at work! For the record, Outbreak probably boasted the best cast; three Academy Award winning actors there (Hoffman, Kevin Spacey and Cuba Gooding, though the last two didn't win theirs until after Outbreak) plus Morgan Freeman, who clearly SHOULD have won an Oscar by now. Neither of the other two movies include any cast members who won Academy Awards for acting (Eastwood got his for directing Unforgiven), although John Malkovich was nominated for his role here. As far as the acting goes, well, Clint's Clint. Basically, he's almost completely beyond reproach in pretty much anything he does; the status of living legend will do that for you. That said, I thought he worked pretty effectively during In the Line of Fire. Certainly he knows how to play gruff and menacing, so that aspect of his performance isn't exactly a surprise. However, Eastwood also convincingly conveys the charm and magnetism of his character. In the end, Horrigan comes across as a real person much better than do most of Eastwood's fairly one-dimensional characters; there's little about this performance that seems phony or contrived. As mentioned earlier, John Malkovich received an Oscar nomination for his role as psycho assassin Macon Leary (he lost to Tommy Lee Jones for The Fugitive). Although Malkovich essentially just did his usually spooky guy thing, I think the nomination was pretty well justified. Malkovich does creepy better than almost anybody in the business, and In the Line of Fire finds him at his eerie best. It's much harder to judge any sort of realism in his performance than it was to view Eastwood's - after all, we don't come across deranged former CIA assassins every day - but Malkovich clearly does what was needed of him for the role; he makes Leary convincingly menacing, and does so with a style that seems unique to Malkovich. 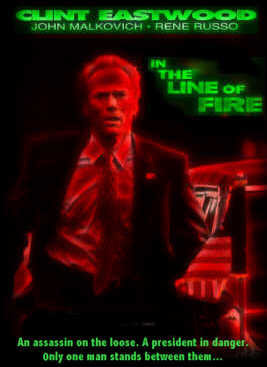 Largely, his and Eastwood's performances are what make In the Line of Fire a better than average thriller. Columbia Tristar have created a reputation for themselves of producing better than average quality DVDs, and In the Line of Fire is no exception. This film's image is extremely clean and sharp. Colors seem bold and vibrant and little to no grain can be found. To put it mildly, this sucker looks great! This is the kind of near-flawless transfer upon which Columbia has built such a strong reputation. Similarly, the movie's Dolby Digital 5.1 soundtrack also works very well. Although it lacks many showy split surround effects, the audio creates a very convincing and immersive sound environment. Dialogue and music always appear clear and crisp. All in all, it's a very pleasing mix. The only downside of the In the Line of Fire DVD comes from its complement of supplemental materials. There ain't none! No trailer, no audio commentary, not even any lame cast and crew biographies. Weak! That fault aside, In the Line of Fire makes for a very good DVD. I'm not a huge fan of Wolfgang Petersen's work, but his films nonetheless have some merits and they afford additional viewings well. In the Line of Fire is a competently made but unspectacular thriller that mainly benefits from very strong performances from its lead actors. There are better films out there, but In the Line of Fire does well enough to certainly warrant interest. James Berardinelli's ReelViews--"In the Line of Fire is one of those rare 'big' movies that doesn't disappoint." Washington Post--"If the real Secret Service is half as bumbling and moronic as the movie Secret Service, it's a wonder any president manages to live out his term." Clint Eastwood: The World Wide Web Page--A truly awesome site with all the pertaining information on Clint and much more! Highly recommended! Mr. Showbiz Celebrities--An excellent source for profile and credits on: Rene Russo and John Malkovich. Amazon.com--Purchase the DVD at 30% off.